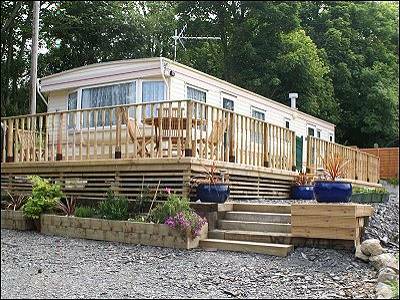 Tresaith Holiday Caravan, West Wales. 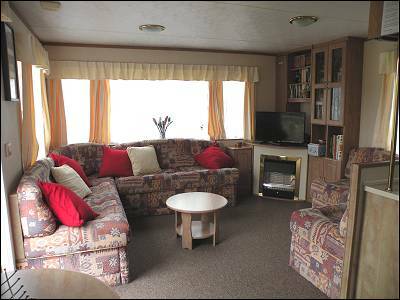 The Caravan at Tresaith is a Bluebird Charisma with double glazing and full central heating and can sleep up to 6 people plus a baby in a travel cot. 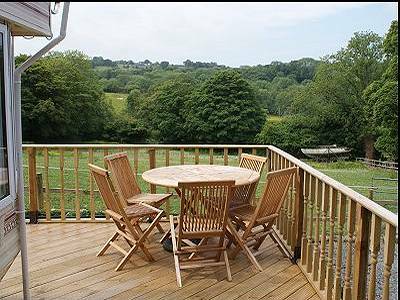 Located in a private area within the grounds of the owners smallholding, the caravan has sea views down the valley being just a few minutes drive to Tresaith Beach. From the caravan, a footpath runs through the woods down to the beach. There is a wrap-around newly installed wide timber deck with railings and gate making this an ideal caravan for a family with children. The field in front of the caravan is available for children to play in if there are no farm animals in the field. Well equipped and with bed linen provided, this is an excellent holiday location close to the beach. One medium or two small dogs welcomed. 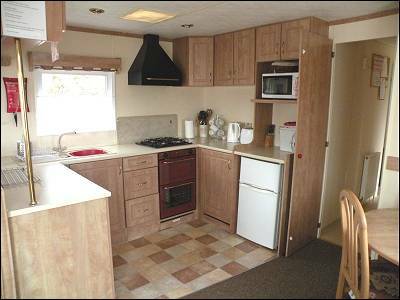 This Caravan has the luxury of double glazing and central heating. 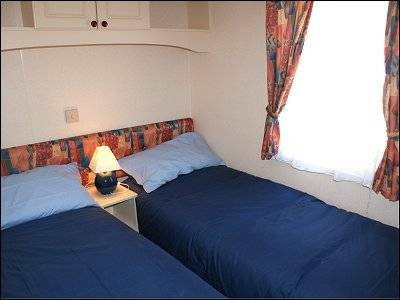 The caravan has a main bedroom with double bed, en suite WC and basin and a twin bedroom where one of the single beds can be removed to make room for a cot or the two singles can be put together to make a large double. There is also a pull out double bed in the lounge. 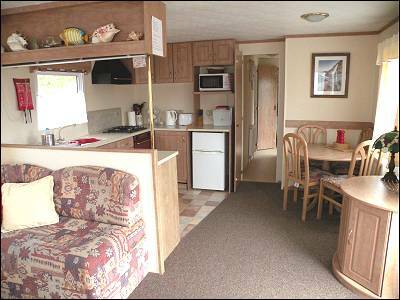 The kitchen is fitted with a full size gas cooker, a microwave, toaster and under-counter fridge with icebox. The kitchen also has plenty of crockery, glassware, cutlery, and cookware for family meals. 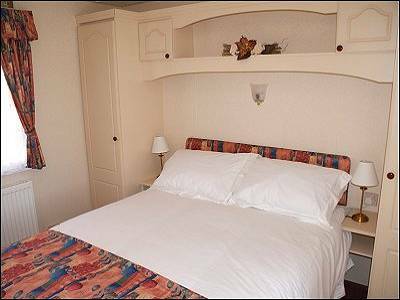 All beds have duvets and pillows with all bed linen provided but guests must bring their own towels. In the lounge there is a 32" flat screen TV with free view and built in DVD player. Comfy wraparound sofas seating 6 (including a sofa bed with bed linen provided) and dining area seating up to 6. Gas fire in lounge area also radiators throughout the caravan. All electricity and gas inclusive of price, radiators throughout. Wi-Fi available in the caravan. for kayaks and water sports equipment. Fully enclosed deck with table, 6 chairs and a bench. A Travel cot is available plus a high chair. One medium sized or two small dogs allowed. This is a non-smoking caravan. 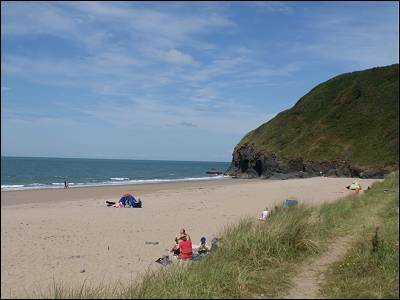 Weekend breaks available - 3 night minimum for £200 - not in all or part of school holiday weeks. Arriving any time Friday, leaving any time Monday. The legend of seven - The word "saith" means seven in Welsh and legend has it that, once upon a time, a king of Ireland had seven troublesome daughters. Having tried in vain to instil some element of control over the seven princesses the king finally lost his patience and ordered his daughters to be cast adrift in an open boat. The currents of the Irish Sea bore the craft towards the coast of Ceredigion and it beached here. The seven princesses fell in love with the sons of seven local Welsh families, married and settled down. 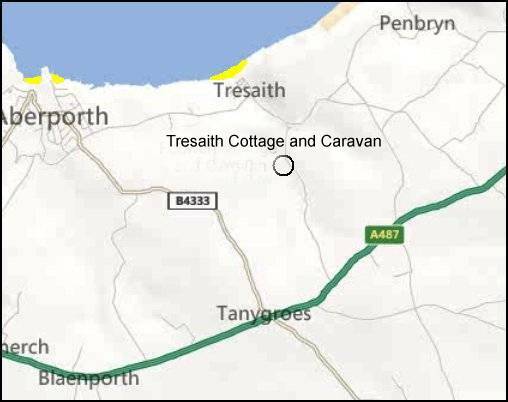 Which explains why the settlement is called "Tresaith" - the town of seven!